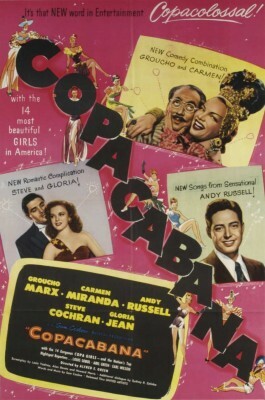 Copacabana (1947) was comedian Groucho Marx's first solo feature, made without brothers Chico and Harpo. His co-starring role, opposite Brazilian bombshell Carmen Miranda, is virtually the only reason people still watch it today and, put into context, his part and his performance are rather fascinating. Needless to say the movie isn't in the same league as Duck Soup (1933) or A Night at the Opera (1935) but then again, it was never a Marx Brother movie to begin with. Rather, Copacabana is a kind of screwball comedy-musical variety extravaganza typical of the 1940s, and on that wavelength it's very enjoyable, if overlong. It's also worth noting that the film marks the final movie appearance of the "Groucho character," who with his funny walk and greasepaint mustache, makes something of a surprise appearance toward the end of the film. For most of the film, however, Groucho more closely resembles the Groucho from the You Bet Your Life (1950-61) years. Originally released by United Artists, Copacabana now resides with Paramount and is sublicensed here for Blu-ray release to Olive Films. The black-and-white image is of variable quality, with fades, dissolves, and other opticals looking rather dog-eared, while straight cuts are notably sharp and sport more detail than previous home video releases. Some background is necessary: The Big Store (1941), the last Marx Bros.' movie made during their mostly unhappy association with MGM, was supposed to have been their swan song - they were all in their fifties by this time - but they reunited for A Night in Casablanca (1946) which, to its credit, was a little better than their last few for Metro. Next came Love Happy (1949), more a vehicle for Harpo and Chico, with Groucho off on the sidelines, disconnected from the main plot. Some years later, all three brothers briefly appeared in Irwin Allen's impressively terrible The Story of Mankind (1957), a movie so perversely illogical that it separated the team for a trio of unfunny historical vignettes. Two years later they teamed up yet again, with Harpo and Chico starring in a pantomimed episode of General Electric Theater called "The Incredible Jewel Robbery." Groucho turns up literally in the final seconds and says all of eight words ("We won't talk until we see our lawyer!"). Good ratings prompted a television pilot called Deputy Seraph, with Harpo and Chico headlining as bumbling angels with, so it was planned, Groucho turning up every third episode or so as a "deputy seraph" who'd bail them out of trouble. But Chico was quite ill with arteriosclerosis by this time and production had to be abandoned. It was the last time they worked together as a team, and Chico died in 1961. So, before he struck gold with the popular radio and TV quiz show You Bet Your Life, Groucho struggled for several years as a solo act. He made three movies in this capacity, the others being Double Dynamite (1950) and A Girl in Every Port (1952), but Copacabana is by far the best. Lionel Q. Devereaux (Groucho) and his longtime fiancÃ©e, Brazilian singer Carmen Navarro, have been a spectacularly unsuccessful nightclub act until untalented Devereaux craftily poses as Carmen's agent. Steve Hunt (Steve Cochran), who manages the Copacabana Club (the real-life Copa, at 10 East 60th Street in Manhattan is still in operation), is moderately interested in Carmen, but wants to see "agent" Devereaux's other clients. Glancing at a betting form he comes up with the name Mme. Fifi, a supposed French torch singer. Hidden under a blonde wig and behind a veil, Carmen-as-Fifi auditions for Steve a second time, and Steve makes the surprising decision to hire both Carmen and Mme. Fifi. Devereaux lays claim to Carmen as his fiancÃ©e, but that doesn't stop Steve from asking out Mme. Fifi. Meanwhile, Steve's secretary, Anne (Gloria Jean), is madly in love with her boss, but he thinks she's in love with his boy singer, Andy Russell (himself). Devereaux, thinking he's pulling a fast one, sells his contract for the non-existent Mme. Fifi to slick agent Liggett (Ralph Sanford) for $5,000. Unknown to Devereaux, however, Liggett has already struck a movie deal for Mme. Fifi worth $100,000. From A Night at the Opera forward, Marx Bros. movies were saddled with musical relief, often featuring second-rate talent. But Andy Russell, born AndrÃ©s Rabago PÃ©rez to Mexican immigrant parents, with his wide smile and ingratiating manner, is unusually appealing, and Gloria Jean (Never Give a Sucker an Even Break) is similarly charming. Probably courting publicity, the picture gives prominent billing to Abel Green, then editor of Variety, and columnists Earl Wilson and Louis Sobol. They play themselves in one brief scene, where Green's performance is awesomely, hilariously bad. He can barely get through his first line ("Hiya, kids!") then as Carmen Miranda seductively strolls past him he swoons so over-emphatically he looks as if he were just shot full of heroin. Copacabana was Groucho's first movie in which he appears more or less as he did in real life. Late in the picture Devereaux suddenly announces to Steve a last-minute tryout of another client of his, who turns out to be the Groucho character from earlier Marx Bros. movies. (Devereaux remains seated next to Steve while "Groucho" performs onstage, a strange, even surreal concept.) Performing Bert Kalmar & Harry Ruby's "Go West, Young Man," the Groucho of yore appears in greasepaint mustache and eyebrows with blackened hair, wearing wire-rimmed glasses and a black topcoat. To the best of my knowledge it would be his final appearance in "Classical Groucho" get-up. Olive Film's presentation of Copacabana is generally fine. While dissolves, fades, and optical effects are at times very dupey-looking, straight cuts are nice and sharp with decent blacks and contrast. The Region A disc has decent audio, English mono only with no subtitle options, and No Extra Features. This is the kind of film best approached with no expectations going in, and certainly not as a showcase for Groucho Marx, though he does come off very well, especially in all his scenes with the irreplaceable Carmen Miranda. Highly Recommended.